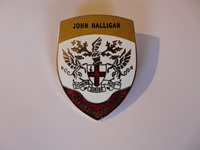 John Halligan, who lives in Hayes, Kent, has had a life-long interest in history. He joined his local Archaeological Society in an amateur capacity in 1969, under the directorship of Brian Philp, the discoverer of the Painted House in Dover. John continues to work with Brian as a volunteer at the Orpington Roman Villa. Between 1996 and 2002 John attended a six year course of evening classes on the History of London under Adrian Proctor, the co-author of the Elizabethan A – Z. In 2004 he successfully completed a year’s training programme to become a Qualified City of London Guide. Since then John has developed fourteen walks in and around the City of London. Each one lasts for two hours and covers a different topic, from the ancient Roman city to Samuel Pepys and the Great Fire of London through to the dynamic buildings that make up the modern city. John’s very enthusiastic about his role as a Guide and said “I really enjoy leading my walks and the positive feedback I’ve had from people coming on them. Most people are unaware of the wealth of history associated with the City, which dates from Roman times”. 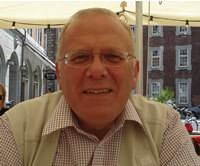 John is also able to guide groups around the Guildhall Art Gallery in the City of London. In addition to the walks, John has developed a number of interesting talks, based on London themes, which are proving to be very popular with a wide range of local groups such as Women’s Institutes, social clubs, U3A branches and friendship groups. Many have made follow-up bookings for their next year’s programme. 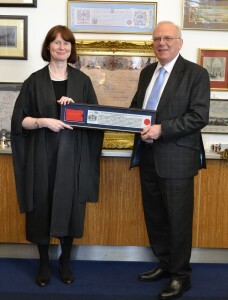 In February 2016 John was proud to be granted Freedom of the City of London in a ceremony at the Guildhall. Pictured on the right is John with the Deputy Clerk of the Chamberlain’s Court.